Golden Gate Bridge by night looking south across the Golden Gate towards San Francisco. English : Golden Gate Bridge by night looking south across the Golden Gate towards San Francisco. Electromagnetic spectrum illustration, an SVG image. English : Electromagnetic spectrum illustration, an SVG image. Albert Harris and his Coconut Shy at Cambridge. English : Albert Harris and his Coconut Shy at Cambridge. Lake in the Ore Mountains, Czech Republic. English : Lake in the Ore Mountains, Czech Republic. English : Brooklyn Bridge at Night. Synthetic Bismuth crystal, discolorations due to a thin oxide layer. English : Synthetic Bismuth crystal, discolorations due to a thin oxide layer. English : Notre-Dame de Montréal Basilica. English : Happy St Valentine's Day. A Dryden's SR-71 Blackbird slices across the snow-covered southern Sierra Nevada Mountains of California after being refueled by an Air Force tanker during a 1994 flight. 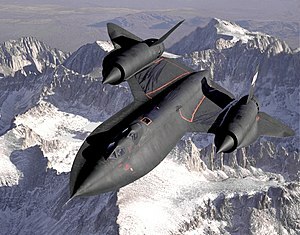 English : A Dryden's SR-71 Blackbird slices across the snow-covered southern Sierra Nevada Mountains of California after being refueled by an Air Force tanker during a 1994 flight. The Sweet Chestnut is a tree (Castanea sativa, family Fagaceae) native to southern Europe and Asia Minor. It is often a large tree attaining a height of 20-35 m with a trunk often 2 m in diameter. The oblong-lanceolate, boldly toothed leaves are 16-28 cm long and 5-9 cm broad. The flowers of both sexes are borne in 10-20 cm long, upright catkins, the male flowers in the upper part and female flowers in the lower part. They appear in late June to July, and by autumn, the female flowers develop into spiny cupules containing 3-7 brownish nuts that are shed during October. English : The Sweet Chestnut is a tree (Castanea sativa, family Fagaceae) native to southern Europe and Asia Minor. It is often a large tree attaining a height of 20-35 m with a trunk often 2 m in diameter. The oblong-lanceolate, boldly toothed leaves are 16-28 cm long and 5-9 cm broad. The flowers of both sexes are borne in 10-20 cm long, upright catkins, the male flowers in the upper part and female flowers in the lower part. They appear in late June to July, and by autumn, the female flowers develop into spiny cupules containing 3-7 brownish nuts that are shed during October. A fire generated by a burning weed. It burned without the use of petrol. The picture was taken with a Canon 20D and a Tamron SP AF28-75mm F/2.8 XR Di lens. English : A fire generated by a burning weed. It burned without the use of petrol. The picture was taken with a Canon 20D and a Tamron SP AF28-75mm F/2.8 XR Di lens. A 1928 Ford Model A, owned by Dan C. on Bowen Island. 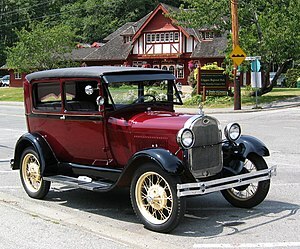 The Model A was the designation of two cars made by Ford Motor Company, one in 1903 and one beginning in 1927. The name usually refers to the latter model. First produced Oct. 20, 1927 but not sold until 2 December, it replaced the venerable Model T, which had been produced for 18 years. The Model A was available in four standard colors, but not black. English : A 1928 Ford Model A, owned by Dan C. on Bowen Island. The Model A was the designation of two cars made by Ford Motor Company, one in 1903 and one beginning in 1927. The name usually refers to the latter model. First produced Oct. 20, 1927 but not sold until 2 December, it replaced the venerable Model T, which had been produced for 18 years. The Model A was available in four standard colors, but not black. This page was last edited on 13 October 2010, at 15:25.